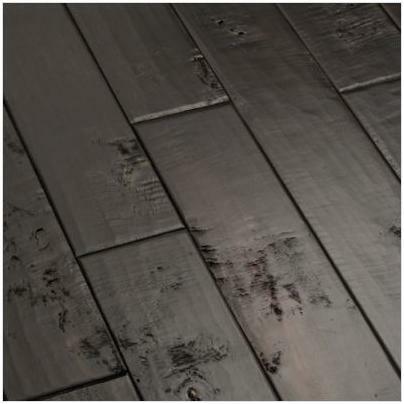 This black diamond engineered hardwood birch flooring features the look of hand scraped and rubbed wood and has a matte, non-glossy finish. The hand planing ensures a unique look that is never duplicated. This hardwood flooring has bevelled edges that are softly rounded and are not angular as you will find in many wooden floors. The Whistler wood floor is treated with ScufResist™ to provide the highest standard of scuff resistant finishes. This superb standard of finish will help resist the normal marks that are often left by everyday wear and tear. The quality of this flooring is supported by a 25 year residential use warranty. The individual planks of wood are 4.5��? wide and they come in lengths of 42��?. This flooring will provide a beautiful floor finishing for the black and bling bedroom or again this flooring is suitable for many rooms in your home. If you prefer a softer finish, you might consider choosing a carpet. A black carpet will look well, but it can be difficult to maintain as it will show every spec of dust. You might consider a silver/grey carpet instead. If it has some variation in the color, it will be easier to maintain and I am all for an easy life when it comes to house work!